Chango R4 Model Ultimate Balance Board from HealthyKin.com is two boards in one‚ a Rocker board and Wobble board. Use as a Rocker board with the 2 smaller 2" wooden rocker balls. 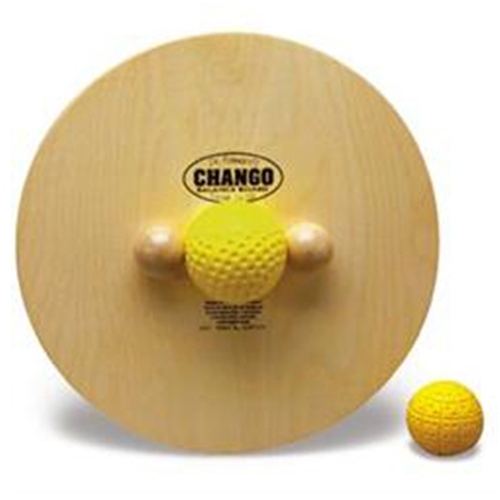 Use as a Wobble board with the yellow, shock-absorbing, center balls. Or remove balls and use on inflatable disc (not included). Great for lower extremity and back rehab. Activates muscles to work in cooperation with one another for good bone movement. Interaction with the nervous and musculoskeletal systems, improves balance, coordination and quickens reflex time. Inner ear is also stimulated by movement and this helps develop balance awareness. After use, the muscles have better tone and the postural muscles go to work to help align the body''s structure properly.